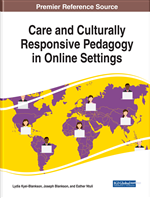 This empirical multi-case study explored a diverse group of postsecondary students' experiences with care in computer-mediated discourse (CMD) from their professors. Participants from a variety of ethnic and cultural backgrounds shared their definitions of care and what they perceive to be qualities of a caring professor. Through participant-selected samples of discourse artifacts identified as exhibiting care, computer-mediated discourse analysis (CMDA) was conducted collaboratively by each student participant and the researcher. The CMDA process highlighted several qualities commonly perceived by students as caring within CMD, organized into three themes: invitation, intentionality, and inclusiveness. These three themes of care are presented through six tenets that professors can use as they build awareness and reflectiveness around their discourse to diverse students in blended, hybrid, and online courses. For decades, ethics of care has been studied in many aspects of education as it is a critical component of teaching children, adolescents and adults (Delpit, 2006; hooks, 2003; Ladson-Billings, 2009; Nieto, 2008; Noddings, 2013a; Palmer, 1997; Sleeter, 2005; Valdes, 1996). A common understanding has been established that building relationships, trust and respect with students is crucial to their academic success (Chen, 2000; Komarraju, Musulkin, & Bhattacharya, 2010; Nieto, 2008; Pascarella, 1980; Rolón-Dow, 2005). Yet, a problem has emerged in post-secondary institutions related to the relationships that are established: although expectations for students are continually demanding, emphasis is lacking in providing social-emotional support, building a strong class community and supporting the diverse needs of students (Goodfellow & Lea, 2007; Kiesler, Siegel, & McGuire, 1984). As scholars in the field of education continue to analyze the ways in which they care for students, it is imperative to reflect on the new contexts of learning and communicating, particularly in digital spaces. As schools continually integrate more technology in education and build more learning spaces online, instructors must carefully examine these online spaces as potential environments for building student-teacher relationships and student-student relationships as well as reflecting attributes of culturally responsive teaching to meet the diverse needs of students. In order to address the issue of recognizing and building care in online learning environments, the purpose of this multiple case study was to understand how college faculty demonstrate care and build relationships with students through their computer-mediated discourse (CMD), and, as a result of this research, to develop a set of tenets for faculty to use CMD as a space for care. The study was designed with the intent to explore the attitudes, perspectives and needs that undergraduate college students have around ethics of care, particularly exuded by their course instructors through digital discourse. Relying on the broader theoretical framework of critical discourse analysis, this study was grounded in the work of Blommaert and van Dijk to examine discourse for potential social power abuse, inequity, and dominance (Blommaert, 2005; van Dijk, 1996, 2008). Because language is socially and contextually situated, it is crucial to analyze those constructs as they relate to the academic relationships built between instructors and students. If educators can conceptualize the contexts in which they are constructing dialogue, the process of reflecting on their online discourse can be a pathway to identifying language and discourse elements that allow students to feel care through CMD. This study also used computer-mediated discourse analysis (CMDA) to examine how ethics of care are present in digital spaces and within faculty-student discourse (Ess, 1996; Herring, 2003; R. H. Jones, 2004). CMDA frames reflexivity in digital contexts based on asynchronous communication in online spaces. Herring (2004) has studied how members of a community can explore macro-level phenomena in their online discourse patterns using the fields of linguistics, communication and rhetoric to analyze online textual behaviors and language use. When they explore this macro-level phenomenon that is evident within discourse of any nature, themes of care can emerge. Contextual: Situated in the experiences, perspectives and attitudes of the involved members. Discourse: Any form of dialogue that occurs between two or more people. Computer-Mediated Communication: The broader context of communicating in digital spaces such as email, chat, or other messaging systems. Aesthetic Care: Ways of caring based on assumptions or generalizations that all people need the same type of care. Authentic Care: Ways of caring that consider the individual needs of the cared for. Ethics of Care: Responding to others’ needs through empathy and a contextual understanding of the individual or cared for. Computer-Mediated Discourse: Online dialogue occurring reciprocally between two or more people.